Central Board of School Education (CBSE) has released roll numbers/ admit cards along with list of 12th Class student who are going to appear in the examination which are going to start from 02nd March 2015 and end to 20th April 2015. 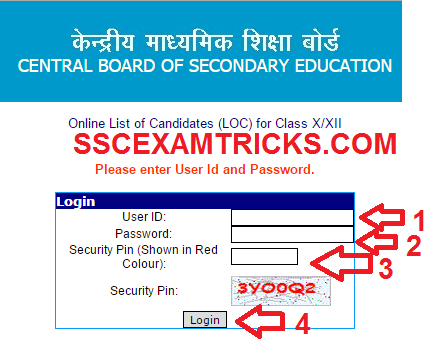 CBSE has also released the list of valid candidates which can be downloaded by using user id and password of the school. It is compulsory to the students to appear in the examination with roll number or admit cards. No student will be allowed to enter in examination hall without roll number or admit card. No student is allowed to carry study material at the venue of examination or into the examination hall. Students are advised that they don’t carry school bag or any study material at the venue of examination. Those students who had filled their application form for Class 12th and waiting for Roll numbers/ Admit cards can download their roll numbers / admit cards from the direct link provided in the end of the posts. Students are advised to note down the timing of examination with session i.e. Morning or Evening session and venue of examination. Download the admit card and make a signature at the column provided black at the bottom of the photograph. Students are advised to take coloured printout of the roll number or admit cards which help to access originality of the candidate via neat and clean photograph of the students. · Select Class of the student. · Enter Name of the student. · Enter Father Name of the student. · Enter Mother Name of the student. · Click on Search button.